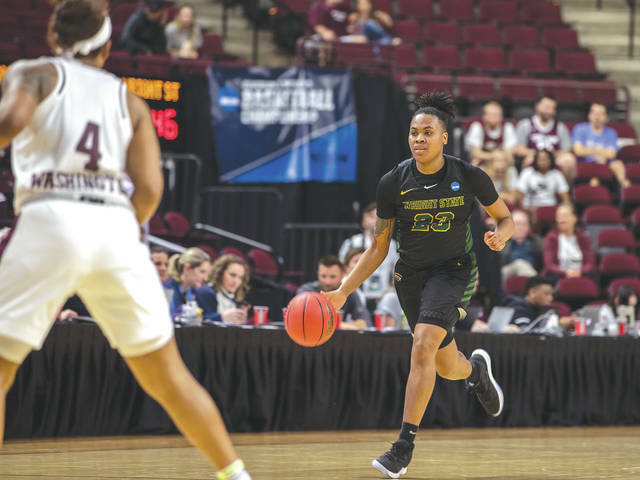 Wright State University senior Symone Simmons (23) hauled in a game-high 13 rebounds in the Raiders’ 84-61 NCAA tournament first-round loss to Texas A&M, March 22 at Reed Arena, in College Station, Texas. COLLEGE STATION, Texas — It’s safe to say that Chennedy Carter’s pinky finger is doing just fine. Texas A&M’s Carter, the Southeastern Conference’s scoring leader playing in her first game since March 3 surgery on a pinky finger that had been broken in two places, scored a game-high 27 points as the host Aggies defeated Wright State University, 84-61, March 22 in Reed Arena on the Texas A&M campus. A&M jumped out to a 31-13 first-quarter lead, and never trailed. The win was the Aggie’s largest in an NCAA tournament game in six years. The SEC team was making its 14th consecutive NCAA tournament appearance. Horizon League champion Wright State (27-7) limited the A&M to 11 points in the second quarter, but could only score 16 of its own to trail 42-29 at halftime. The Aggies outscored the Raiders by a 42-32 margin in the second half. WSU was making its second appearance in the NCAA tournament, and first since 2014. Angel Baker led WSU with 22 points, Michal Miller scored a dozen points, Mackenzie Taylor added 10 points to go with six rebounds, and Symone Simmons finished with seven points and a game-high 13 rebounds. Joining Carter among the Aggies’ scoring leaders were Kayla Wells with 17 points, Ciera Johnson with 15 and N’Dea Jones with 11. All three players scored personal-bests for an NCAA tournament game. The Aggies set a season high for 3-pointers in a game with eight in the win, hitting 41.7 percent of their tries from behind the arc. Texas A&M (25-7), the tournament’s No. 4 seed in the Chicago Regional, advances to the second round of the NCAA tournament to face No. 5 seed Marquette, an overtime winner of Rice, on Sunday, March 24 at Reed Arena. The Raiders lose seniors Emily Vogelpohl, Mackenzie Taylor, Symone Simmons and Imani Partlow with the loss. Wright State’s 27 wins are a women’s basketball team school record. Information courtesy of Texas A&M University (12thman.com) and Wright State University athletics (wsuraiders.com).